Interested in riding with us? We offer several levels of riding for all ages and skill sets. Our After School Program is a wonderful introduction to riding for elementary and middle school aged children. Our Caterpillar Club riding program is designed to teach school age children the basics of English riding and horsemanship. Your child will learn the basics skills of riding in safe and supervised setting while enjoying bonding with one of our adorable ponies. Our trainers will carefully match each student's ability and riding level with an appropriate horse or pony. Watch your little rider bloom from a caterpillar to butterfly! Making Summer Plans? Sign Up for Our Summer Camp! What is more fun for a child than spending their summer caring for and riding horses?! 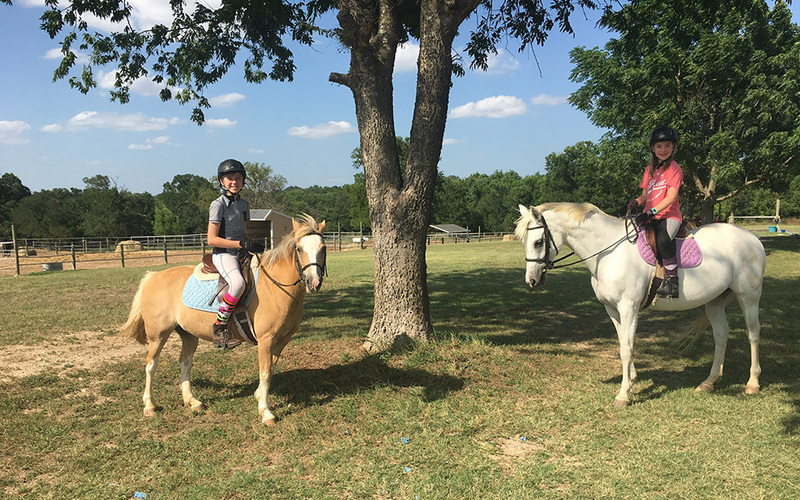 Our campers will enjoy engaging outdoor activities in the company of our experienced lesson horses and ponies and qualified adult camp leaders and counselors. Interested in taking a lesson, or touring our facility? Schedule facility tour and meet our team to learn more. Monarch offers group and private lessons to riders of all levels on experienced ponies and horses in a serene setting. Group lessons are 60 minutes long and cost $55, the group size is limited to 5 riders per lesson. Private lessons are 30 minutes and $65. We need 24 hours’ notice to cancel a lesson without charge.